In 1909, Fargo Mercantile Co., a wholesale grocer, built their new offices and warehouse in a new four story brick building at 401-403 Broadway. Designed by the Hancock Brothers and constructed by C.H. Johnson & Co., the building was used as a grocer until 1961 and sat vacant for six years before it was demolished in 1966. The existing building at the corner of Fourth Avenue North and Broadway in downtown Fargo was constructed in 1967 and was most recently home to Schumacher Goodyear. We are celebrating the space before returning it to its historic roots as a walkable, mixed-use building at one of downtown Fargo’s most active intersections. With no immediate plans for the space, Kilbourne Group conceptualized temporary uses for the existing building and ways to celebrate the space, rather than letting it sit vacant. With the help of a number of local organizations the site came alive in the summer of 2016 with craft beer, a food truck, a farmer’s market, local theater groups and live music. Today, the site is home to Creatively Uncorked, the Red River Market, Fargo Food Truck Park, and numerous pop-up events. We are excited to continue activating this space in Fargo’s vibrant downtown neighborhood. If you are interested in using the pop-up space, send us your ideas! We’d love to hear from you. The company started out in the Dacotah Block, and used the two storefronts and basement for its stock. After expanding into the Hagaman Block on 2nd Avenue North, the need was quickly felt for a new building dedicated specifically for the business. It was constructed at 611 N.P. Avenue, in a building called the Martin Block. It was designed by the Hancock Brothers, and constructed by J. H. Bowers construction. By 1909, growth again necessitated a larger building, so the N.P. building was sold (it would become the Orphium Theater). A new four-story brick building located at 401-403 Broadway was constructed for the exclusive use of the business. It was designed by the Hancock Brothers, and constructed by C. H. Johnson & Co. The company offices were located on the first floor, the second floor was dedicated to packaging and cigars, and the rest of the building used as storage. A railroad spur behind the building gave direct access to the nearby Great Northern Railroad tracks. In the early 1950s, the company became a branch of the Griggs, Cooper & Co. based out of St. Paul, Minnesota. In 1953, the company name changed to the M. J. Sullivan Food Distributors, and it remained under that name until the late 1950s. In 1960, the Fargo city directory lists Philco Distributors in the building, and by the next year it was vacant. The building sat vacant for the next six years, before it was torn down in 1966. 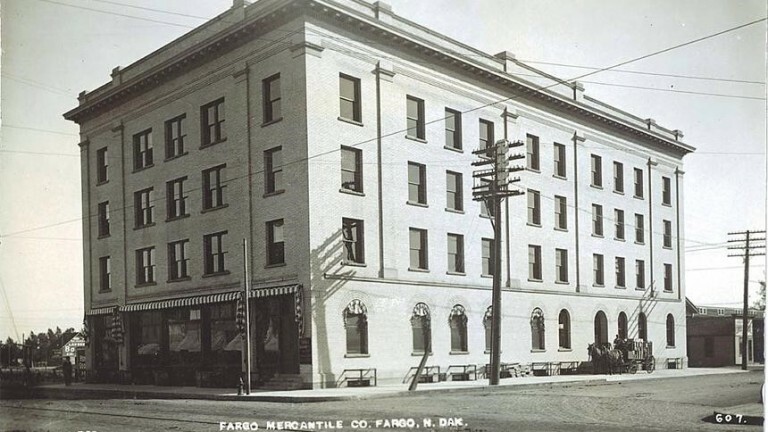 For more information about the history of Fargo Mercantile Co., visit the NDSU Archives.